I don’t know if this game has a commonly used name. It was invented (or reinvented) by me and a friend under the name Connex. The rules of the game are simple. Players take turns at drawing a line between two dots on a regular grid. If a line makes an area water-tight, the area belongs to the player that drew the line. The game ends when all areas have been claimed, and the winner is the player with the largest combined area. Our AI is reasonably hard to beat, but can be tricked in some situations by an experienced player. 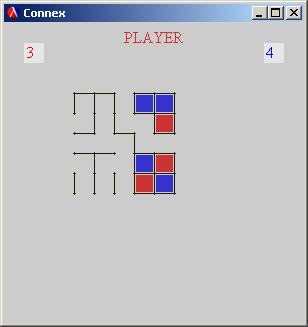 The AI was implemented in Lisp and uses a simple graphics library for the user interface.